Bar 71, 71 SW 2nd, 241-3434, Tues 8-10 pm, Wed-Thurs 4-6:30 & 9-12 pm. Bar 71 has a fairly confusing happy hour, but they've always got something on special. Tuesday's 8-10 pm happy hour has cheap beer and nachos, while Thursdays hours have $2 drinks and drafts. Basement Pub, 1028 SE 12th, 231-6068, Mon. all night, 3-8 pm the rest of the week. Cheap little plates of food go great with huge glasses of beer. Micros run you $3 and PBRs cost $1.50. Bridgeport Ale House, 3532 SE Hawthorne, 233-6540, Mon-Fri 3-6 pm. Cheap food that isn't deep fried, including a smoked salmon salad, spinach and artichoke dip, a cheese quesadilla and a hummus plate. Daily beer specials, too. 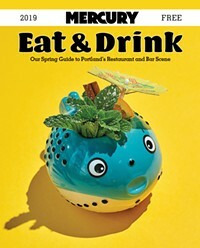 East, 322 NW Everett, 226-1569, Mon-Tues all night, Wed-Fri 6-10 pm, Sun 6-10 pm. Wells and pints cost a measly $2 during East's many hours of happiness, and an Asian-themed menu has plenty of items including pot stickers and steamed pork buns for around $4. Italian Joint, 3145 SE Hawthorne, 234-3004, Tues-Thurs 4-6 pm, Fri-Sat 10-11 pm. An enormous and tasty bowl of pasta starting at $4, and the Joint offers a carafe of wine for pittance, and that's not even on special. Interstate Bar & Grill, 4234 N Interstate Ave, Daily 11 am-6 pm. $2.25 wells, $2 domestic beer, $3 imported, and $1 PBR's open to close. Plus, don't forget to try the Interstate B & G's infamous chicken wings. Kesone Thai Cuisine, SW 13th & Washington, 228-5775, Daily 5-6:30, Fri-Sat 9-11 pm. Delicious spring rolls, calamari, chicken wings, fried tofu, pork and chicken satay all for $2-4. Marathon Taverna, 1735 W Burnside, 224-1341, All the time. The Marathon pretty much has happy hour prices all the time with $2.50 wells anytime they're open, and gyros, burgers, and garden burgers that cost about $5 and are startlingly delicious. $10 for 10: Your Best Bang For the Buck NEW YEAR'S EVE Options!